Now that January is bringing lots of cold, snowy weather, some friends in the U.S. are saying that one of their goals for 2016 is to get away to someplace warm…soon. My suggestion: Head to southern Spain, to sunny Jerez de la Frontera. It’s warm, colorful, exciting, and—thanks to the current low euro—very affordable. Temperatures right now in Jerez are in the 50s and even 60s F, with sun pretty much all day, every day. Okay, so that’s too cold for swimming at the beach… But for those who like to acknowledge the seasons but don’t want the extremes, those temperatures are just about perfect. “Yep, this is winter,” you can say, as you slip on a sweater or light jacket and head out to sit at a sidewalk cafe. 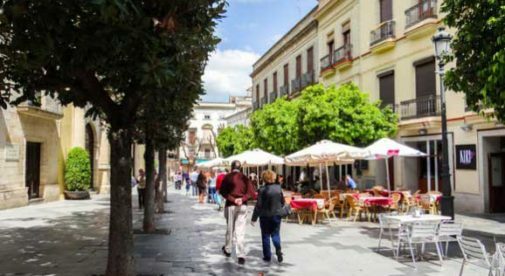 In towns like Jerez de la Frontera, in southern Spain, you’ll enjoy tasty tapas, beautiful weather, and a very affordable lifestyle. I spent my days strolling the streets of Jerez’s historic center. I sipped coffee or sherry over the daily newspaper at the city’s many bars and cafes. Or I’d grab a few tapas for lunch. 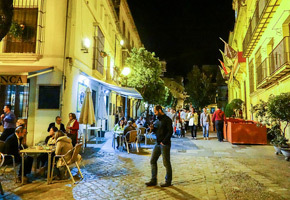 In Jerez, nobody seems to eat at home…they’re all at the outdoor cafes munching tapas. A couple of tapas and a sherry—costing you as little as $6 or $7 in all—makes a filling lunch. And of course I toured the area. Ten minutes from Jerez is the beach, at El Puerto de Santa María, another sherry town that sits right where the Guadalete River pours into the Atlantic. And the grand city of Cádiz, with miles of beach, is only half an hour away by train. Both cities are worth a visit for their seaside ambience, lovely historic buildings, and excellent seafood. And don’t forget to try Cádiz’s crisp white wines with your food; there’s more than sherry in this part of the world. To top things off, you’ll be pleasantly surprised at how affordable life is here. Spain has always been one of least expensive countries in Europe, and the Jerez area is particularly affordable. And these days it’s even more so, thanks to the favorable exchange rate. So if winter has you blue, consider a trip across the pond to enjoy sun, fun, and fabulous food in southern Spain. It sure beats shoveling snow. Learn more about Spain and other countries in our daily postcard e-letter. Simply enter your email address below and we’ll send you a FREE REPORT —Live the Good Life in Sunny, Affordable Spain. This special guide covers real estate, retirement and more in Spain and is yours free when you sign up for our postcards below.